12th June, 2014. Brazil opens a World Cup as host for the first time in 64 years with a group match against Croatia. The Brazil team lines up arm in arm as the opening chords of the national anthem whir around Arena Corinthians. Before the opening lyrics are uttered, Neymar is pictured blinking back tears, as are several of his teammates – the emotion of the occasion producing an undevourable lump in their throats. Hulk, Paulinho and captain Thiago Silva close their eyes. Julio Cesar, Fred and David Luiz fight the overwhelming emotion with fire, bellowing every word of the anthem, their faces tight with vigour, eyes bulging and veins exposed. Much like the English national anthem, typically, only the first verse of the Brazilian anthem is sung at public events. Twelve months earlier at the Confederations Cup, the streets outside the stadiums throbbed with revolution and, most visibly, tear gas. Protests raged over the cost of hosting The Copa while Brazilians continued to pay first world tax rates for third world public services. In an atmosphere thick with protest and defiance, the anthems before those Confederations matches were bellowed at a cacophonous volume. As the music stopped, the crowd carried on in defiance, singing the second verse a cappella. The players joined them. As Brazil swept to the Confederations Cup title, it looked like a powerful statement of patriotism and harmony between the team and the public. Against Croatia, the crowd and players repeated the trick. The crowd yelled the second verse and the players again joined them, their volume rising. David Luiz looks more like a singer in a death metal band, his face racked with adrenaline. On this occasion, the extended anthem does not look like a powerful joint statement. It looks like a release valve for the immense pressure that the team is under. This theatre of emotion came to define an ill fated campaign. The team had the appearance of a getaway car speeding recklessly through a busy intersection. A crash was inevitable, as an imperturbable Germany coolly dissected the Seleção’s brakeless vehicle. 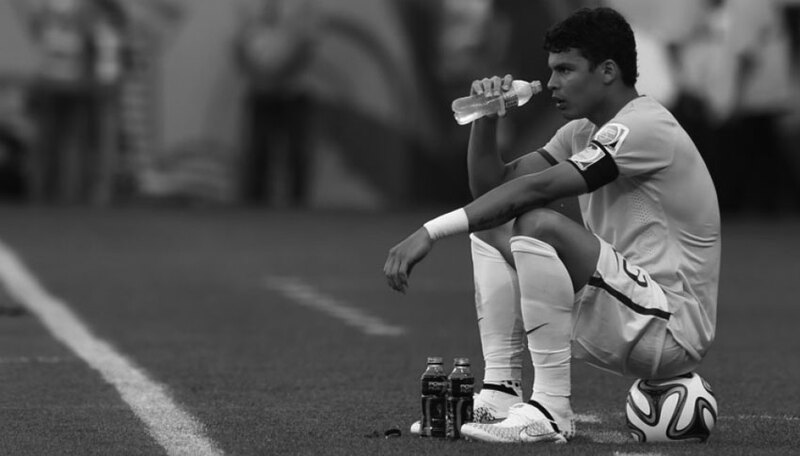 Watching on from the sidelines in the Mineirão was captain Thiago Silva, suspended for the humiliating 7-1 defeat. Initially, Thiago must have been relieved to have been disassociated from this mauling. Recriminations were abound as the Brazilian public again begged for a revolution. The decline in Brazilian football had been visible to all but the willfully deluded (the CBF) for some years. Maybe the fallout of this nuclear result could enable Brazilian football to reflect and rebuild. Scolari was nudged onto his sword, but the CBF quickly moved to quell any maudlin optimism by appointing Dunga. Meet the new boss, same as the old boss. Quite literally. From ancient grudge broke new mutiny as Brazilians came to terms with a lack of appetite for change in the crony filled corridors of power. Whilst no revolutionary in terms of football nous, Dunga’s ceaseless surliness offered an antidote to Felipão’s avuncularity, which had allowed fragility to fester in the squad. 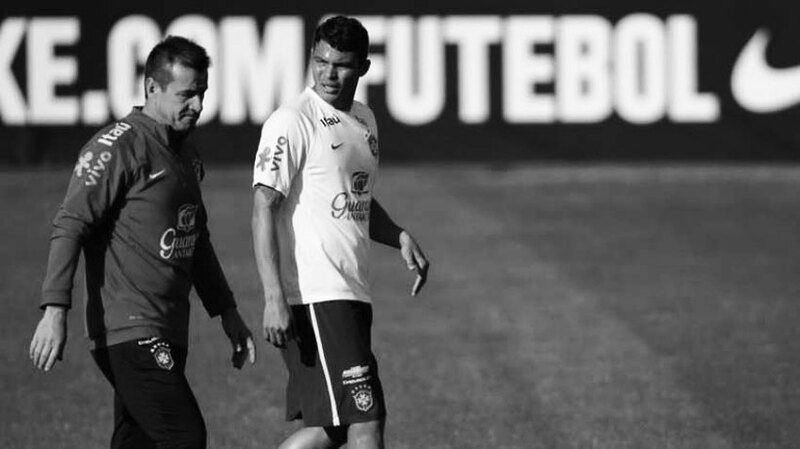 Dunga was a depressingly conservative appointment, however, his most significant act of revolution has been to cast Thiago Silva, regarded as one of the world’s finest centre halves, into the shadows. Unimpressed by Thiago’s teariness during the World Cup, Dunga’s first act in office was to strip Silva of the captaincy and hand it to Neymar. Thiago was injured for Dunga’s first two squad selections. When he returned to fitness, however, he found himself displaced by João Miranda in the starting eleven. By March 2015, Dunga had stopped calling him up at all, preferring Gabriel Paulista and Gil. Silva was criticised for his conduct during the World Cup 2nd round penalty shoot-out against Chile. He broke down in tears before the shoot-out began and refused to watch. Looking on from his sofa, Dunga was clearly less than impressed with his antics. Dunga had taken and converted penalties in the 1994 World Cup Final and 1998 World Cup semi-final shoot-outs whilst wearing the Seleção armband. When quizzed on the PSG man’s exile, Dunga’s responses are thinly veiled. “I regard the players as men- not children!” he spat when Thiago complained publicly about being stripped of the captaincy. In an emotive fit of pique, Silva also turned fire onto his team-mate Neymar, who had deposed him, “He never came to talk to me,” he complained, “I never spoke to anyone, it was done without any conversation. That’s what upsets me.” Such self-piteous words would only have entrenched Dunga’s impression of Thiago as a bit of a cry baby. The coach eventually offered an olive branch. Keen to cleanse the stain of the World Cup, Dunga wanted to make his mark by winning the Copa América in Chile 2015. Resigned to the fact that he needed his best players, the coach called for Thiago Silva, who started the tournament on the bench. Brazil’s Copa campaign was barely three minutes old when a horrendous mix up between David Luiz and Jefferson allowed Christian Cueva to put Peru ahead. The Seleção eventually struggled their way to a stoppage time victory, but Dunga swung the axe. David Luiz was dropped for the remainder of the tournament, with his PSG team-mate Thiago Silva welcomed back into the fold alongside Miranda. However, the resurrection was short lived. Brazil led Paraguay by a goal to nil in the closing stages of the quarter-final. Paraguay won a corner and Thiago Silva senselessly thrust an arm into the air to paw the ball clear of the area. A penalty was duly awarded and converted. The match went to a penalty shoot-out. This time, Thiago did not rock backwards and forwards in prayer; there were no tears in his eyes as his team-mates collected themselves for the penalty kicks. Instead, he was forced to fend off the overtures of beleaguered team-mates. Filipe Luis and Douglas Costa remonstrated with him. Robinho repeatedly mimes the handball incident and shrugs. Silva’s expression is creased into a frown as he tries to explain his error. Brazil lost the shoot-out and Thiago has not pulled on the canary shirt since. Instead of clutching the olive branch that Dunga had offered him, Thiago Silva reached up and clutched the ball in the penalty area. This was the final confirmation for Dunga that Silva could not be relied upon under pressure. Three months earlier, the defender committed a similarly dunderheaded handball in a Champions League knock-out match with Chelsea. The decision to ostracise the 30-year-old centre back in this way runs at odds with the treatment of other players that have let the coach down. David Luiz has hardly shown steely nerves at centre back, which Dunga seemed to concede by dropping him so quickly during the Copa América. Even Neymar is not guiltless in this respect. His emotional meltdown after an ill-tempered 1-0 defeat to Colombia in the Copa América was not befitting of a leader, and symptomatic of the immense pressure placed on his shoulders. His petulance after the final whistle had blown earned him a four match suspension and cost Brazil any realistic chance of winning the tournament. It’s difficult to escape the conclusion that Dunga’s grudge with Silva is a personal one. His current squads are littered with players every bit as flaky as Thiago Silva but nowhere near as talented. Dunga has always been a confrontational character, motivated by acrimony. He recently said of ex-teammate Romário, “Friendship requires respect, loyalty and utmost confidence in integrity. For that reason, Romário has never been my friend.” (Romário himself is a laconic character, to say the least). During a 2-0 friendly win over Argentina in Beijing in October 2014, Dunga became embroiled in a row with the Albiceleste bench, during which he repeatedly gesticulated towards his nose, an action widely interpreted as a cocaine based slur. During the 2010 World Cup, Dunga swore repeatedly at a Globo journalist for answering a personal call during a press conference. If the coach was offended by Thiago Silva’s ‘mis-adventured piteous overthrows’ over the loss of the captaincy, what of this PR monstrosity uttered by Dunga last June? “I think I’m an Afro-descendant because I get hit so much.” On that occasion the manager was forced into contriteness, apologising for the remarks later that day. If the sight of his players remonstrating with Silva prior to the Paraguay shoot-out did not appear familiar to Dunga, they ought to have. As Brazil captain, he visibly fought with team-mates during a 1998 World Cup match with Morocco. Dunga and Thiago Silva are two households both alike in dignity. Whilst it is true that Thiago Silva has failed to exercise emotional restraint in pressured situations, so too has Dunga. That familiarity underscores this simmering dispute, where civil blood makes civil hands unclean. For never was a story of more woe/ Than this of Dunga and his Thiago. Who is the next great Brazil center back or emerging from Brazil apart from Marlon Santos ?